This is the Cast O'Gear invented by Oskar van Deventer, who has contributed with many other designs to the Cast Series, and it was released by Hanayama in October 2002. It was first introduced in 2001 at the 21st IPP Design Competition, at the time simply called, Sunflower. It can be categorized as a Sequential or Route-Finding puzzle. It is one of the largest puzzles in the Cast collection, measuring around 9cm in height and also, one of the most interesting designs. Other large puzzles available include the Cast L'œuf and the Cast Duet, which curiously were also invented by Oskar himself. You're presented with a gear containing five teeth, locked in a cube with six holes. Your goal is to find the correct hole path to remove the gear. Now, sequential puzzles can be considered boring, for taking too much time or because you can often find yourself in the same place you started. However, the design of the Cast O'Gear is cleverly done to intrigue you and encourages you to keep going. When you're trying to solve it, take a bit of time to carefully inspect it and pay special attention to the slight details and differences in the puzzle. Note that each tooth at the right and left of the main one (the tooth with the hole) has a difference in thickness. 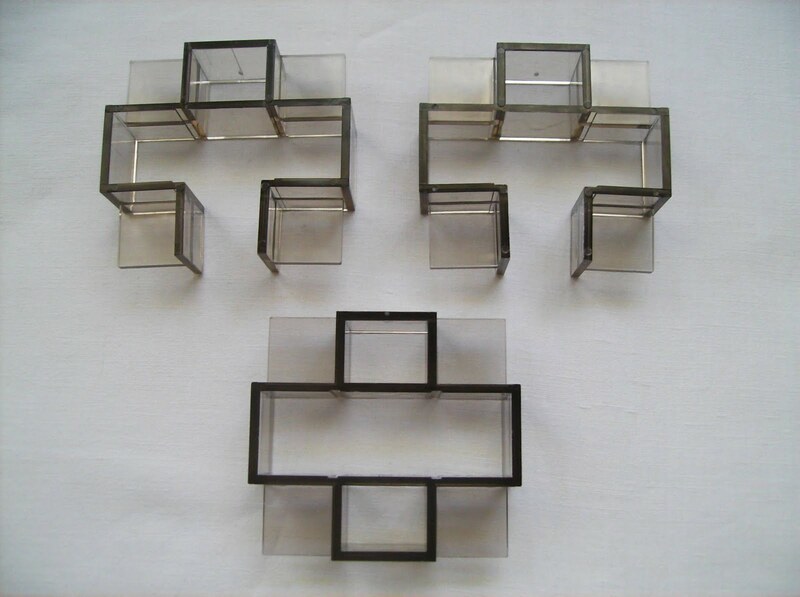 Now, take a look at the cube face that's opposite of where you started (the one with two extra holes at the edges), and you'll see that it's different from the ones at the four sides of the cube, which by the way, are all identical. That's the face you need to focus and the gear teeth that have the difference in thickness, as one of them is going to allow you to remove the gear. 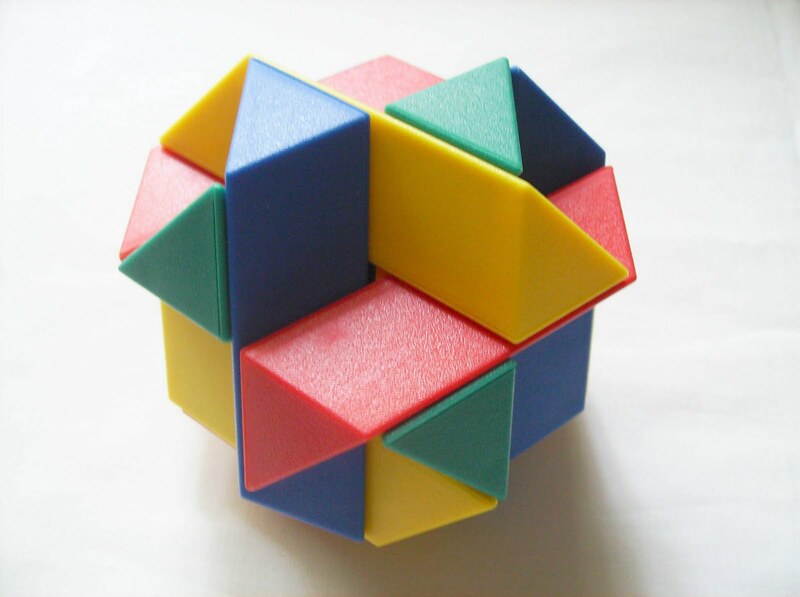 All that you need now, is find a way to pass the right tooth in the bottom cube's face. If you're still struggling after this, take a look at the solution here. The Cast O'Gear is not that difficult, if you don't think about the boring part of finding the right sequence of movements... The goal is intuitive and you know what you're supposed to do, you just need time to get there eventually. 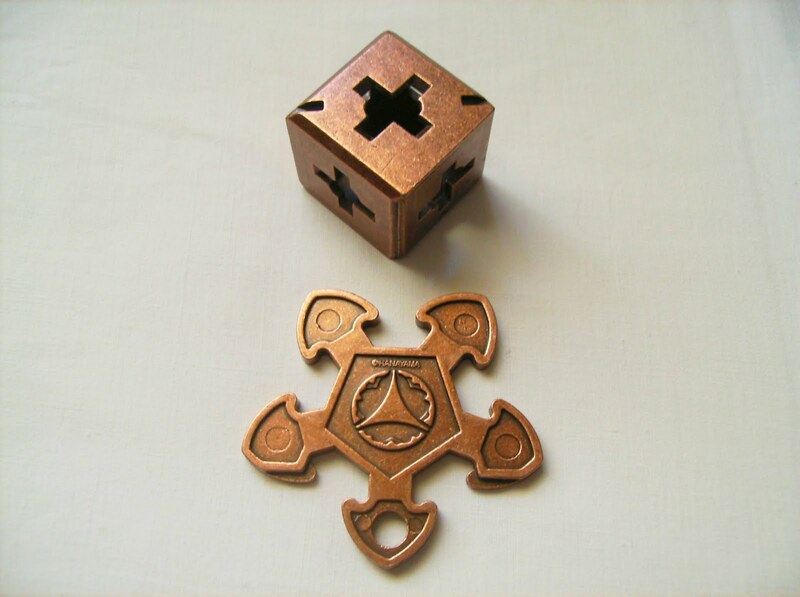 Hanayama rates the puzzle at 3 out of 6 and PuzzleMaster 7 out of 10, so it's just around the middle of the scale. Returning the gear to its original position is way easier than removing it, contrary to most other Cast puzzles, mainly because you're more familiar with the puzzle's features and particularities. Oskar's Cast O'Gear is available at PuzzleMaster for CAD $12.95. 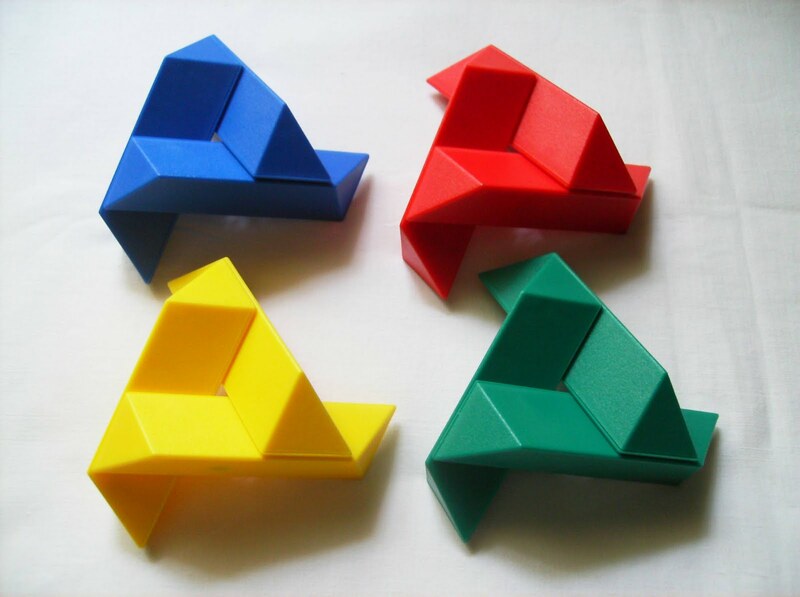 The Tetraxis puzzle is an invention by John and Jane Kostick. 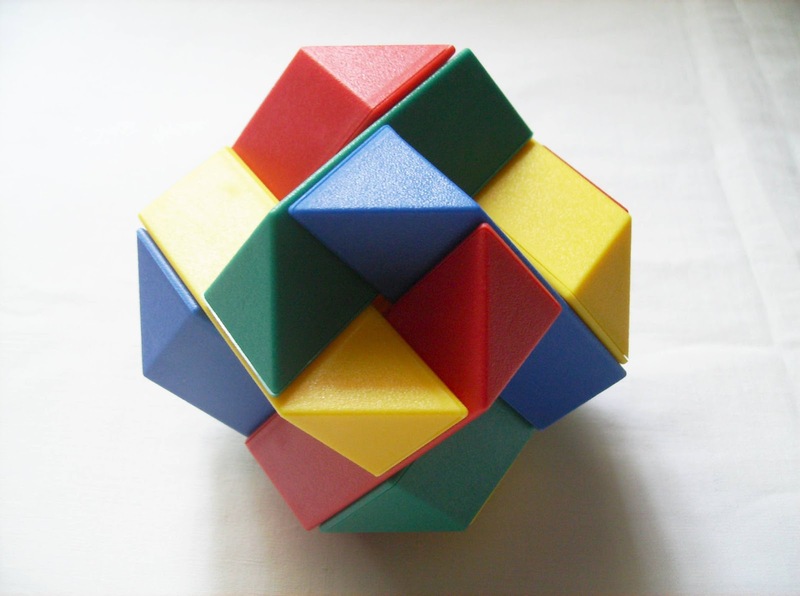 It's a magnetic puzzle designed to stimulate the brain's ability to recognize symmetry and color combinations. 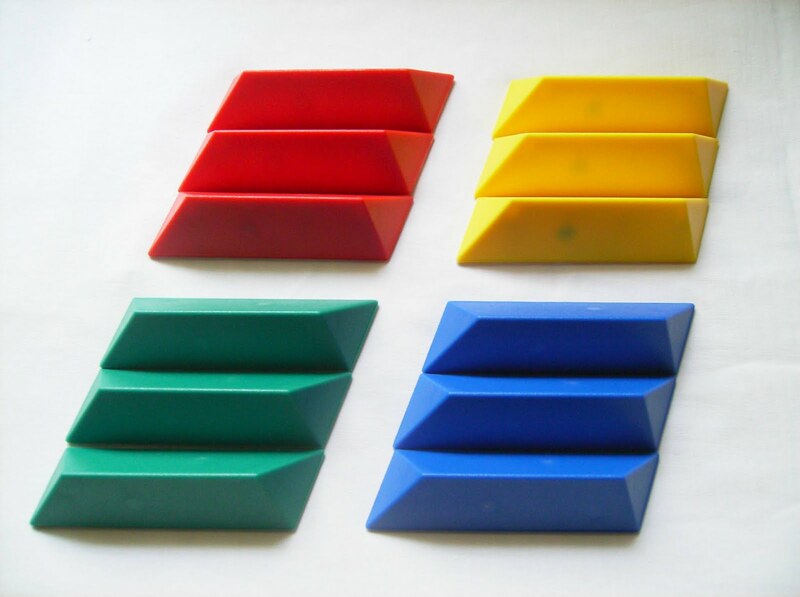 There are twelve sticks shaped like a triangular prism, divided in four colors (yellow, green, blue, red). 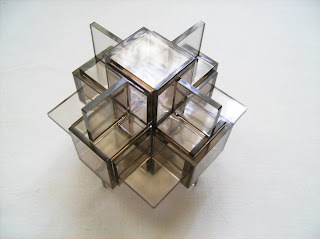 Each piece has four magnets, two in the parallelogram base and one in each of the prism's other two faces. Building shapes is easy and intuitive, as the sticks only connect in a way that feels just right. To build the puzzle in its original shape, you can start by joining two pieces together. Add a third stick to form a pinwheel. Now build three other ones and you're left with four identical pinwheels. It won't be much harder to join them one by one until you have the final shape built. After that, just make sure if the color combinations are right, as you might need to swap a couple of sticks to get the desired combination. Tip: try to build each pinwheel with three sticks of the same color. You'll end up with another cool color combination. 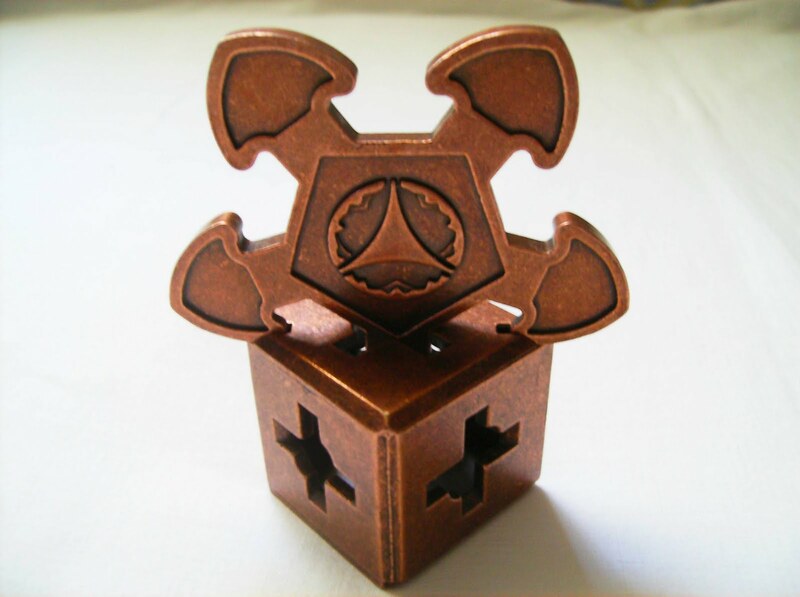 The Tetraxis comes boxed in its most recognizable shape already built. The color combination that you'll see right away is three sticks of the same color, pointing at the same direction in a triangular orientation. However, there are other several combinations that you can try yourself. For example: try to have only one of the three colors pointing at a particular direction for the entire original shape (image below). For other challenges, visit the Tetraxis' image page (Scroll down). 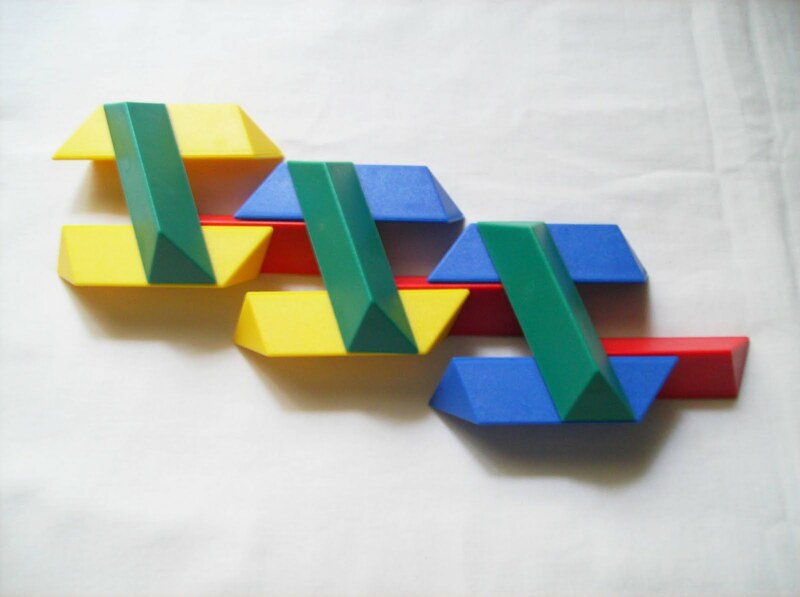 You can also use the sticks to assemble the puzzle in different ways other than a closed shape. Some can be magnetically linked (right image below), while others you can use a mixture of magnetically linked and just touching each other, like the four pinwheels below at the left. The pinwheels are linked together by the magnets, but they're only touching each other in a plain surface. 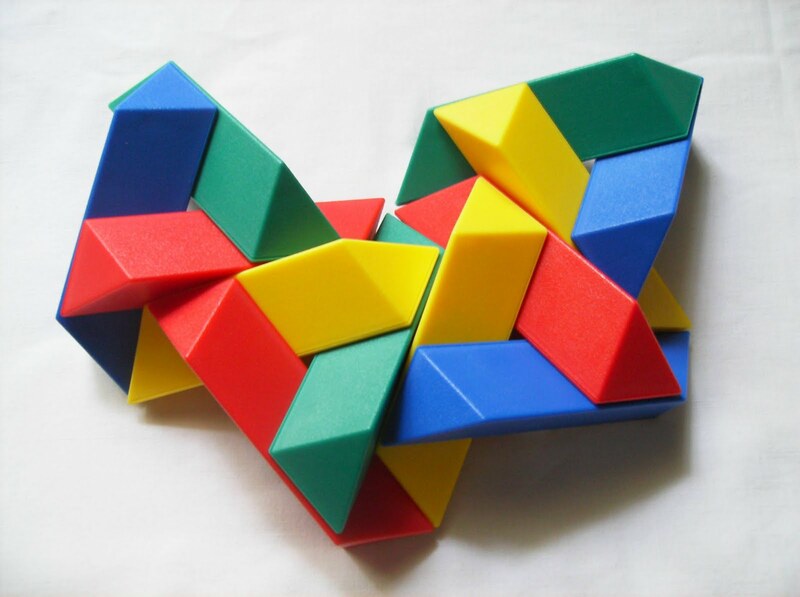 You can also see in the Tetraxis' image page, other shapes you can build with more than one puzzle. There are countless possibilities, only limited by your own creativity and imagination. 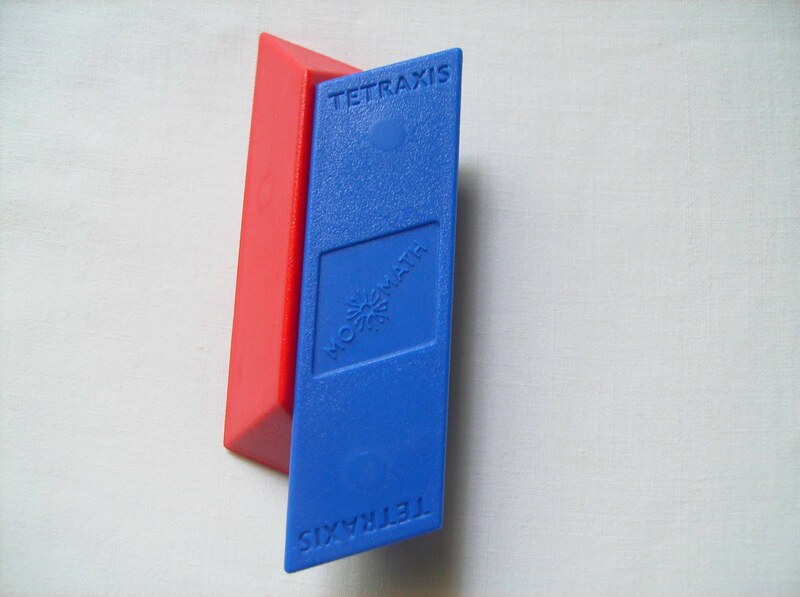 If you're into the type of puzzles that can yield the best of your creativity, then the Tetraxis is a recommended toy for you. 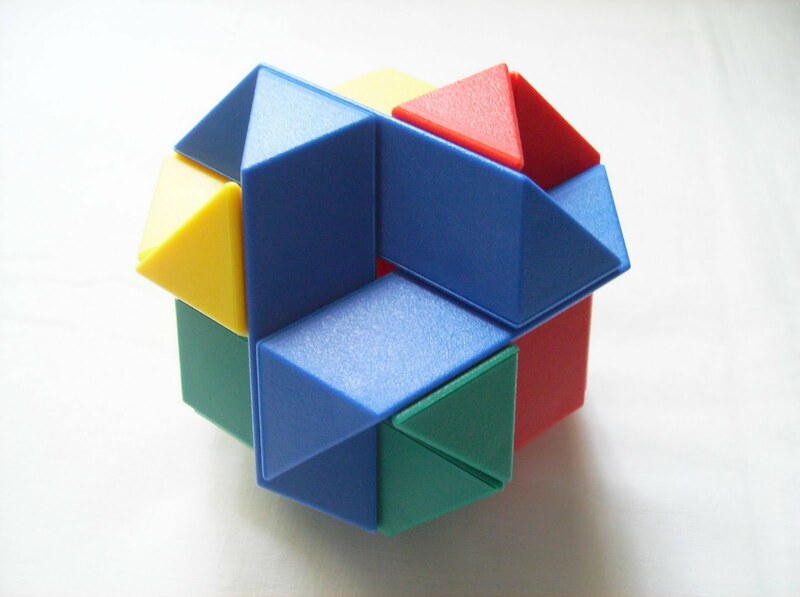 Whether you'll get one or more puzzles, you can be sure to have many hours of plain fun with the building possibilities that the Tetraxis can offer. It's also great to have one in the workplace to refresh your creativity. The creators also do exquisite hand-crafted artwork, with similar structures and a few more complex shapes. If you'd like to know more about these products, you can go to the creators website and take a look at the great collection available. You can contact the designers if you want to buy anything from the site... Here's a video that shows one of these fine sculptures. Also available from the MoMath website. The Lunatic Lock is designed by Gary Foshee and this particular edition is produced by PuzzleMaster. Now, for the challenge itself, which is what matters, you won't be disappointed. When you think of a lock and the way that they are opened, you may think immediately of a key. 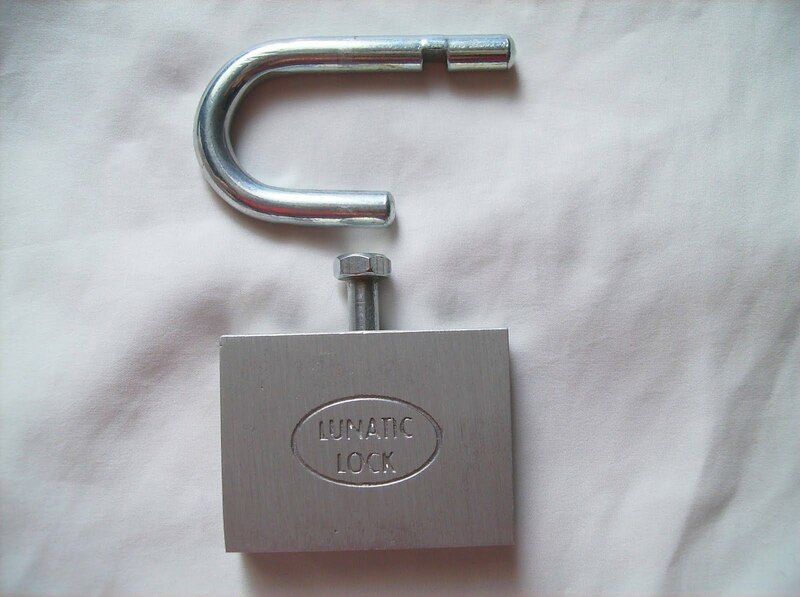 However, these trick locks are very different. They require a completely different approach for opening them. The only "key" provided in this specific lock is a small pin that looks like a screw. If you shake the puzzle close to your ear, you'll be able to hear something inside. Try to move the pin up and down while rotating the lock and eventually you'll lock the pin in the middle position. Just continue to do this until you finally get the puzzle unlocked. 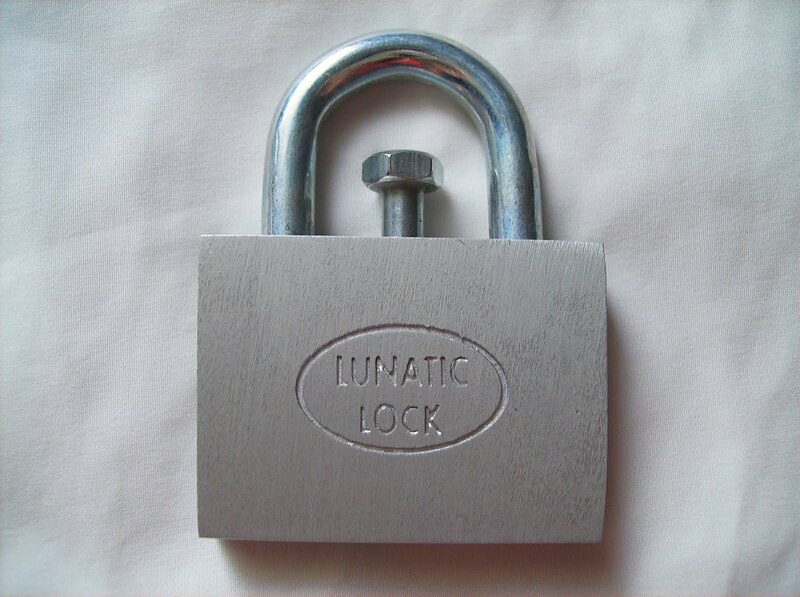 The Lunatic Lock is rated by PuzzleMaster as an 8 out of 10, which is "Demanding", so you'll have plenty of entertaining time, unless you get frustrated before... If you find yourself "locked" without a clue, you can download the solution here. Despite being a little rough on the finishing touches, like the brushed aluminum, The Lunatic Lock provides a satisfying challenge for the trick locks fans and for someone that likes all kinds of mechanical puzzles. You can find the Lunatic Lock at PuzzleMaster for CAD $15.95. 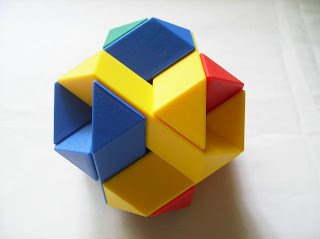 Curios Cross is a Put-Together or Interlocking puzzle made by manufacturer Magnif. 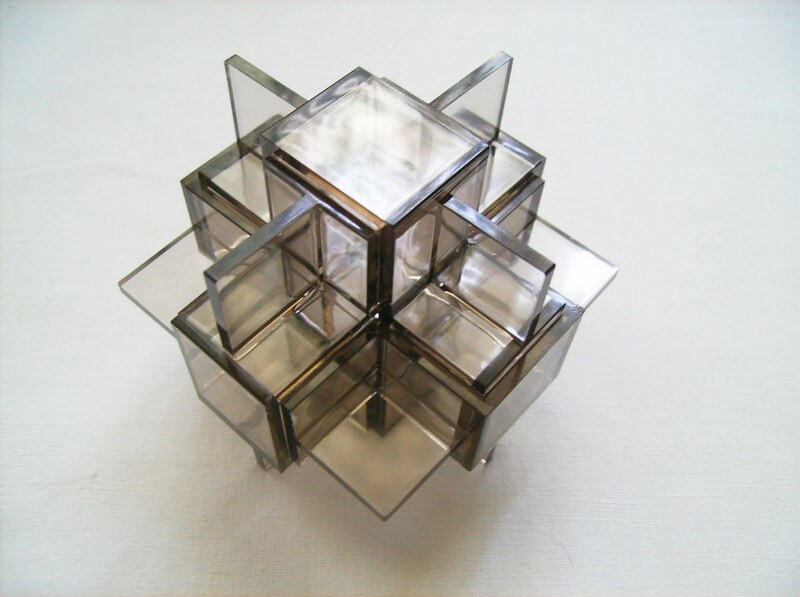 Made of clear plastic, to better see the intersecting planes, your goal is to build a cross from only three pieces, two of them identical. The puzzle comes in its box unsolved so there's no way to cheat. Also, I think if it were already assembled, it could very easily be broken in the disassembling process, due to the nature of the plastic used. 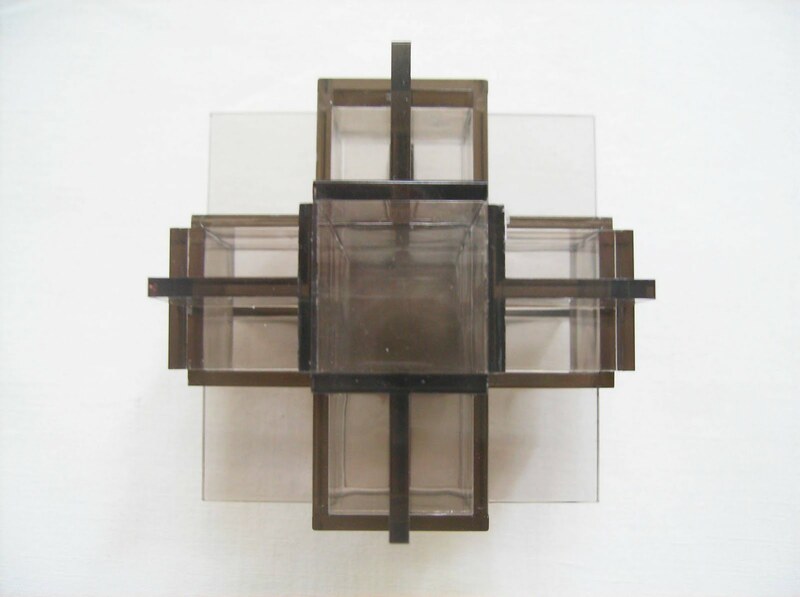 This way you have to think how to correctly place each piece to achieve the desired shape. I'm not going to explain a step by step solution, but I can give you a few hints to better tackle the challenge. 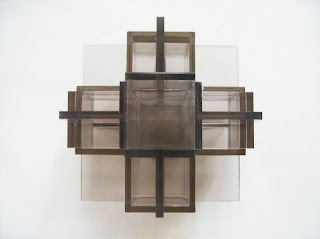 Given that you have three pieces to work with, and two of them are exactly the same, that leaves a single piece that's obviously the main one and the first of the sequence to build the cross. Next, you just have to find a correct order to put the other two pieces, keeping in mind that only when the three pieces are partially connected, you can slide them into place. Once you've successfully built your cross, it's awfully hard to disassemble it, but if you do it right after, it's easily accomplished, because you may still remember the order that the pieces were placed. You don't need to worry about that though, because once the cross is built, it's a beautiful decorating item for any desk, unless you want to challenge any of your friends. Overall, the Curious Cross is a nice challenging puzzle. The fact that it's made of clear plastic with a bit of tint, makes it visually much more appealing, although it's very easy to break if you're not careful. You can check PuzzleMaster's website for more Magnif and other related puzzles.